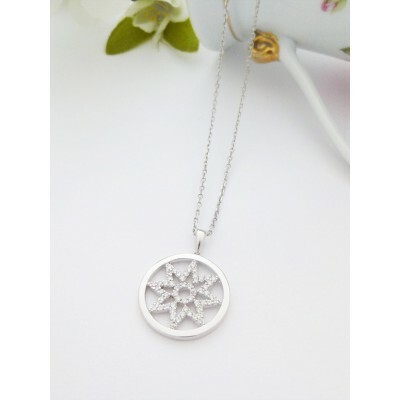 The Georgini Arabella has a beautiful star pendant with an eight pointed star with an inner circle encrusted with white cubic zirconia stones and set in a highly polished sterling silver circle. A really young and funky design, perfect for the younger lady that has a bit of hippy in her and also likes jewellery that is high quality. If you like star pendants then the Georgini Arabella is both relevant and also unique in its design. The star is proportioned perfectly within the circle and the polished finish of the sterling silver circle and backing perfectly complements the white cz stones that make up the eight points and circle of the star. 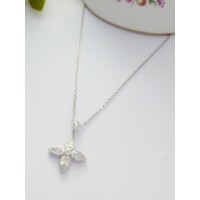 A very on trend and funky ladies star necklace backed by the quality of the Georgini brand. 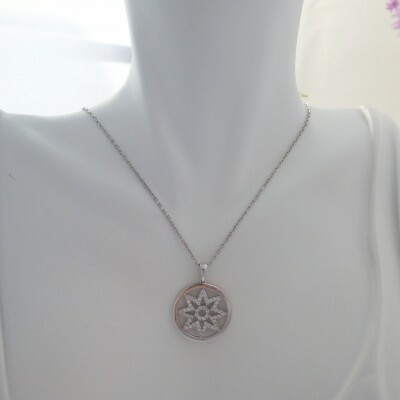 The star circle has a diameter of approximately 20mm with and eight pointed star. 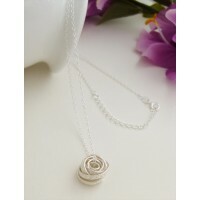 The necklace chain for the Georgini Arabella is approximately 39cm and features a 5cm extender chain. 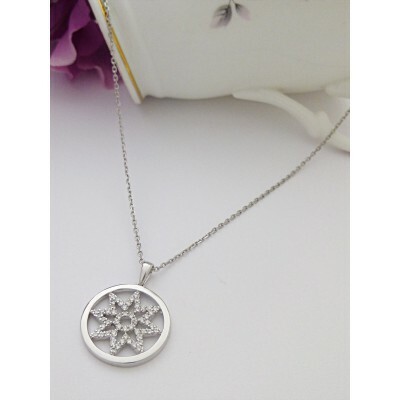 This necklace is hallmarked 925 sterling silver with the Georgini brand name engraved. The Georgini Arabella features and 8 pointed star set in a sterling silver circle. 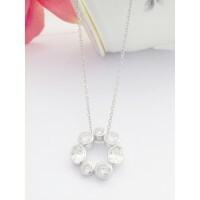 The star and central circle are filled with white cz stones set in a sliver base. This is hallmarked 925 sterling silver with the Georgini brand on the necklace chain tag.